Day 4: July 14th / 10:30pm local time. Today was our last day of service. Our students have been working extremely hard this week and it showed this morning. However, as expected, these young men and women rallied and finished their last day with the same energy and enthusiasm as day one! Tonight during our download time we paused to thank the Loftsgard Family. Marilyn and her husband Eric are missionaries in Nicaragua. They have been serving the people of this country for over 18 years and have been partnering with Kingsland for over a decade. They have seen dozens of our teams come in and out of here and always welcome us with open arms. This is probably why so many of our students through the years refer to their family as “our” missionaries! This week Marilyn has been our hero. From buying bottled water to translating to keeping us on task, Marilyn was the key to our success this week. She made all the pre-trip arrangements and her attention to detail and has made our stay so much easier! We could not have done any of this without her! But even more admiring is her patience and grace with us. She handles our complaints, questions, and comments with such poise. 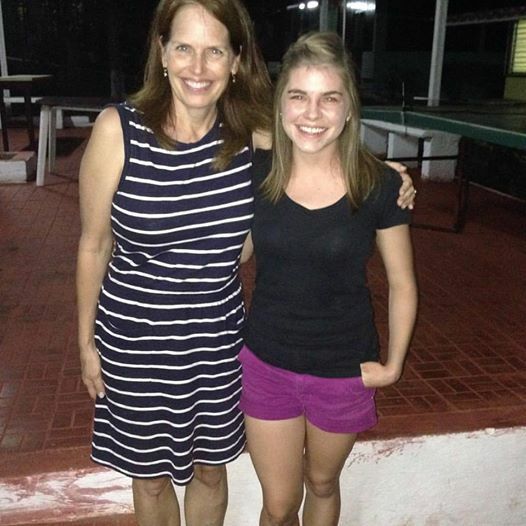 I can see why the people of Nicaragua love her so much! We were also blessed to have Marilyn’s daughter Leah serve with us. Leah was our point person at House of Hope and showed our teams what true service and unconditional love is all about. Seeing a family so united in service is humbling. Tomorrow we take a day to enjoy the other parts of Nicaragua. Weather permitting we hope to tour a volcano, take a boat ride around the lake, and enjoy some time in the local market. Our team is definitely looking forward to tomorrow! This entry was posted in Family, Leadership, Nicaragua, Sacrifice and tagged KSM Mission Trips. Day 3 Report: What does love require of me?